In the "Organic Keyword" Report (in the site explorer), it would be great if there were check boxes so I could add interesting KWs to my KW lists in KW Explorer directly from Organic Keyword-report. This would save me alot of time during KW research. When analyzing a competitor domain, I would LOVE to have a checkbox beside the keywords that domain ranks for that I can use to add a bulk number of keywords to a keyword list. This would help to speed up keyword research by allowing you to analyze competitive domains and add relevant keywords to a keyword list. Yes. 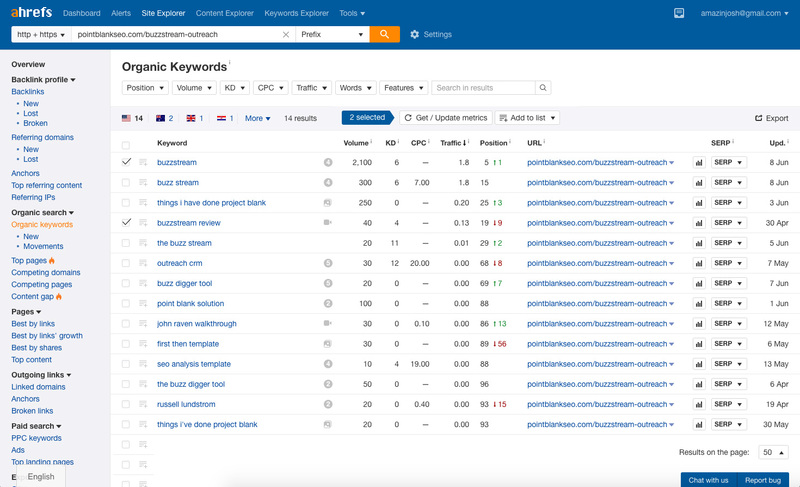 All keywords found anywhere in Ahrefs should be added to either Keywords Explorer or Rank Tracker with a few clicks. That would just be brilliant. @Tim Soulo ... I started another thread that is similar to this, but instead of adding the keywords to Rank Checker, I was looking at adding the keywords from the organic keywords report to a keyword list during keyword research. Is this being added to the roadmap? This should definitely be on the roadmap already. I have no idea why this isn't a top feature. It would be very good if we could have that function http://take.ms/9MgAb as well here http://take.ms/v5iUQ in the site explorer. Like that i dont need export them here and in an addition keyword research. I could collect all and then later check the list in the keywords list and export all at once. One of the easiest way to do keyword research is stealing competitor keywords. ahrefs also has a blog post about it. But unfortunately, there's no easy way to select keywords from "site explorer organic keywords" and see details stats or add to keyword list in "keyword explorer". Please add that feature. I love how I can see the organic positions without having to add them myself. BUT: if I want to track them via Rank Tracker, I have to manually add them. I'd opt for a check box to be able to choose which of these organic keywords to track in Rank Tracker. Co-sign. I think it should be possible to export keywords anywhere in Ahrefs to KWE. And to Rank Tracker as well IMO. hey @Nathan Veenstra I'm not quite sure what you mean here. Could you please give me more details? And maybe share some screenshots/screencats? That would easily save me 15 mins a day. @Joshua Hardwick: Nice one Joshua!